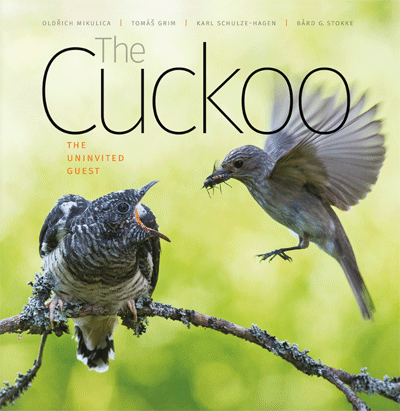 The Cuckoo features prominently in today’s ornithological literature, most notably in Nick Davies’s splendid ‘Cuckoo: Cheating by Nature’, published only last year. This new book from a team of Czech, Norwegian and German ornithologists and a Czech photographer addresses the same subject matter but in a dramatically different way. Davies’s book was a conventional, though highly accessible, science book, heavy on narrative and argument. By contrast, this book has a much more ‘light touch’ text with much of the impact coming from its photographs. The two works are therefore complementary, a point underlined by the fact that Davies has contributed its eloquent Foreword. The text comprises fifteen chapters, each dealing with a particular aspect of Cuckoo breeding biology. These cover the whole spectrum from host selection through egg laying, incubation and hatching, host chick ejection, feeding and fledging. Underpinning the whole fascinating story is the theme so well rehearsed in Davies’s work - that of an evolutionary arms race between the Cuckoo and its hosts. Final chapters provide some further fascinating contexts - the strategies adopted by other brood parasites around the world, an insight into the tools and techniques used by Cuckoo researchers and a summary of the conservation challenges facing this species. The chapters are relatively short but are engagingly written and crammed with useful facts and anecdotes, and some valuable historical perspectives too. Despite the high quality of the text, the most eyecatching feature of this book is its outstanding collection of Cuckoo photographs, the work of Oldrich Mikulica, 2011 European Nature Photographer of the Year. The range and quality of the images is breathtaking, from intimate close-ups of life in the Cuckoo host’s nest to highly evocative portrayals of birds in the wider landscape. There is plenty of action too - fights between Cuckoos, Cuckoos mating, aerial duels with hosts, egg-laying and the endless demands of the Cuckoo chick. And there is a further twist. Davies’s book brought us the story of the Cuckoo in Britain and its familiar hosts - Dunnock, Meadow Pipit and Reed Warbler. Here we are transported to the marshes of Eastern Europe and images of a whole array of new and surprising Cuckoo hosts - Marsh, Great Reed and Barred Warblers, Golden Orioles, Red-backed and Lesser Grey Shrikes. We are also taken to Finland where Cuckoos parasitise Common Redstarts in the very different world of the taiga forest. The most telling messages of the book come in its final chapter. Here the authors present the sobering facts about the now well-documented decline of the Cuckoo, particularly in parts of Western Europe. They cite accounts from nineteenth century Germany in which over a hundred Cuckoos could be counted gorging on caterpillar plagues. Such spectacles are, however, long gone. Unsurprisingly, the authors draw a direct correlation between the steepest Cuckoo declines and agricultural intensification. The key to helping this most fascinating and beguiling of birds lies, as it does with so many other species, in the reinvention of our agricultural landscape. Pre-publication offer: save £5 when you pre-order at www.wildnaturepress.com.